LOW SIGMA TRANSITION The BSA Bottom Bracket Shell is oversized to increase the lateral stiffness of the frame in order to maximize the pedaling efficiency and transmit to the wheel all the power generated by the cyclist as well as for structural reasons, minimizing the tensions in a deeply stressed area. 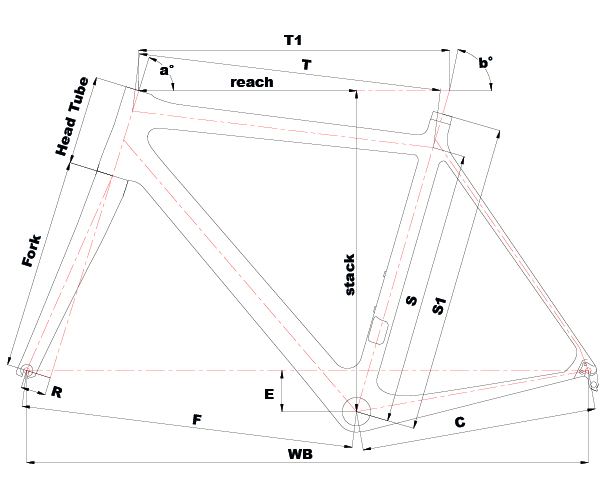 The result is that of reducing the weight and increasing the frame durability. DYNAMIC RACE GEOMETRY The geometry of Veltrix has been designed to have the best ratio between the length of the horizontal tube and that of the seat tube, for the best position on the saddle. This allows a better aerodynamic position and an optimal balance of the cyclist’s center of gravity: best push on the pedals in the steepest climbs or intense shots together with an excellent control in fastest descents. 1,5” MEGAHEAD The 1” 1/2 oversized fork with tapered head tube guarantees the best driving precision even at higher speeds, making Veltrix incomparable in direction changes. The cable passage is completely internal either for mechanical or electronic assemblies, improving aerodynamics and chassis aesthetics. Nato per la competizione, Veltrix è un telaio monoscocca in carbonio veloce e reattivo. Facile da guidare, soddisfa sia chi ha watt da vendere che il corridore con un passo più costante. Le sezioni degli elementi del telaio sono state ottimizzate per sfruttare al meglio le caratteristiche di leggerezza e di rigidità della fibra di carbonio, rendendolo molto performante.